By far the most impressive karst landscapes of Africa – and maybe the whole world – are found in Madagascar. Anjajavi Forest – Madagascar, Mahajanga. Picturesque karst area, covered with pristine Madagascaran dry forest. The limestone here has unusual forms – countless natural arches, hoodoos, caves, and others, rising as small islands from Moramba Bay, all covered with unusual plants, such as baobabs. An area with special biological diversity and numerous rare and unique species. Great Tsingy de Bemaraha – Madagascar, Menabe. Unique karst landscape, consisting of thousands of rock blocks dissected by 80 – 120 m deep grikes with vertical walls. Mostly formed by the collapse of caves and caverns. Sometimes these grikes are very narrow, less than 1 m and create an immense impression on the one walking through them. Countless interesting karst formations, including caves, natural bridges, tufa pseudoroofs. 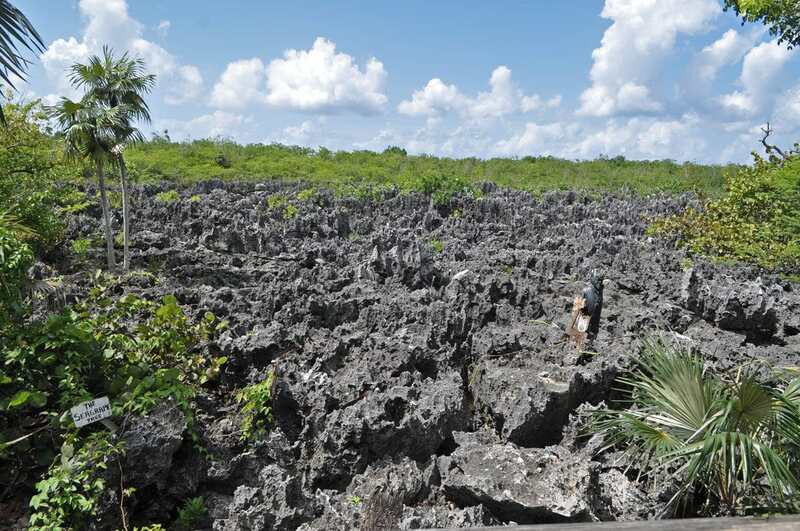 Numerous endemic species of plants and animals – 47% of locally met species of plants and animals are found only in Tsingy de Bemaraha – for example, here are 34 endemic species of reptiles. Manambolo River Gorge – Madagascar, Menabe. Spectacular gorge – both banks of the river are formed by giant, steep and often overhanging cliffs of Bemaraha Tsingy. Numerous caves, natural bridges and other interesting karst formations. 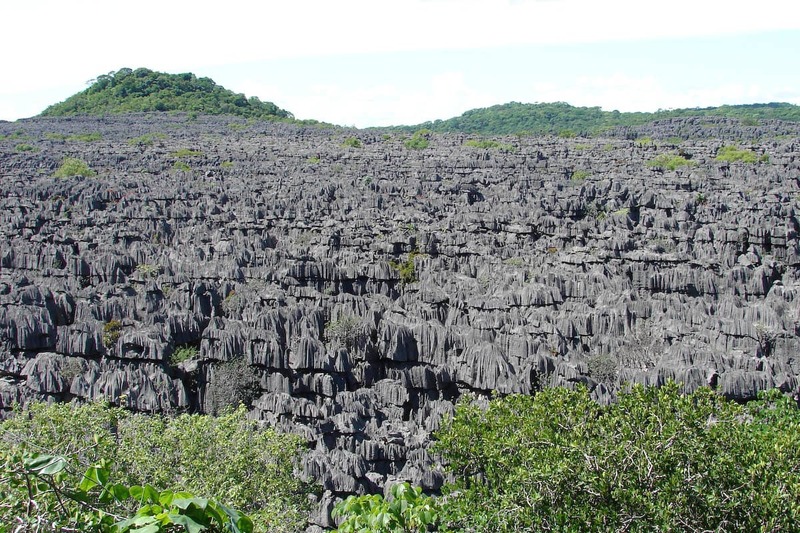 Tsingy de Namoroka – Madagascar, Mahajanga. An area with very impressive, up to 80 m tall tsingy formations – walls, needles, canyons and also numerous caves. Huanjiang Karst – China, Guangxi. Very impressive and large area with cone karst – cone-shaped limestone hills over an area of more than 7000 ha. Libo karst area – China, Guizhou. Typical cone karst area with cone-shaped, forested hills. Shibing karst – China, Guizhou. Very impressive landscape with thin dolomitic towers rising hundreds of meters tall above the plain. Shilin stone forest – China, Yunnan. Spectacular karst formation, which resembles a giant forest of stone pinnacles. One of the most impressive karst landscapes in the world. Three Natural Bridges – China, Chongqing. Part of larger, Wulong karst area. One of the most dramatic landscapes worldwide: deep canyons and gorges in limestone with multiple natural bridges, giant sinkholes, and extensive cave systems. Xingwen Karst – China, Sichuan. Extensive and diverse karst area with impressive karrens, giant sinkholes and cave systems. 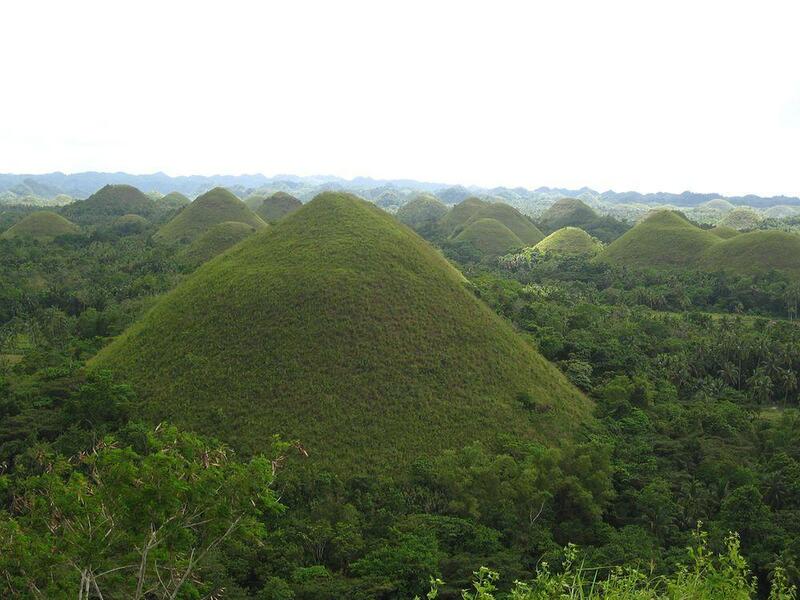 Chocolate Hills – Philippines, Bohol. Unique geomorphological phenomenon – 1,200 – 1,776 similar grass covered conical hills which form a unique landscape. The height of each hill – 40 – 120 m. During the dry periods, hills turn brown. Formed from coral limestone which has been uplifted and eroded. Hills contain numerous caves. Coron Island – Philippines, Palawan. 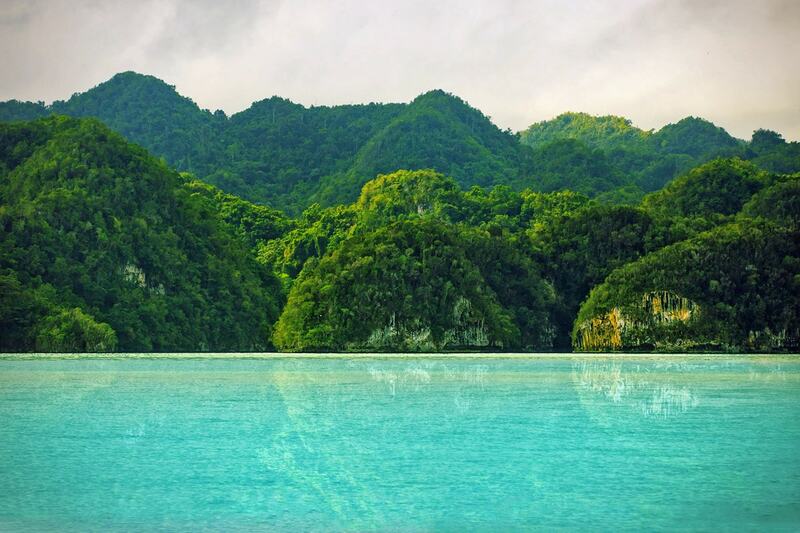 Beautiful, forested island with steep limestone cliffs and numerous interesting rock formations up to 600 m high. Kayangan Lake has extremely lucid water. Dong Van Plateau – Vietnam, North East. An area with very impressive tower karst where the cone-shaped limestone hills rise up to 800 m tall. Here are very impressive canyons, huge biodiversity values. 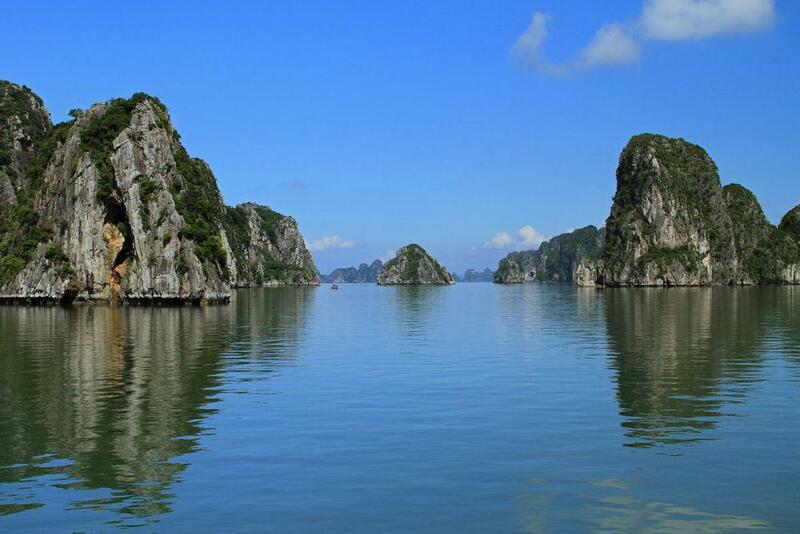 Hạ Long Bay – Vietnam, Northeast, Quảng Ninh province. A site of unusual beauty – sea bay with approximately 2,000 tower-like islands formed by karst processes. Tallest islands are 100 m tall. The area contains many endemic species of plants and animals. Some islands have impressive caves (such as Hang Đầu Gỗ Cave). Local fisherman live in exotic-looking floating villages. Phong Nha-Kẻ Bàng National Park – Vietnam, North Central Coast. Impressive karst landscape with some of the largest caves in the world such as the Son Doong Cave. Here is located longest known cave river in the world. Tam Cốc-Bích Động – Vietnam, Red River Delta. An area with beautiful tower karst formations. Here are found numerous caves. Hiraodai Limestone Plateau – Japan, Kyushu. Unusual karst plateau with extensive limestone pavement. Khammouane sinkholes – Laos, Khammouane. Possibly the largest concentration of enormous sinkholes in the world, most are not explored. May hide the largest sinkholes by volume – there are stories about sinkholes up to 230 million m3 large! Mount Api pinnacles – Malaysia, Sarawak. 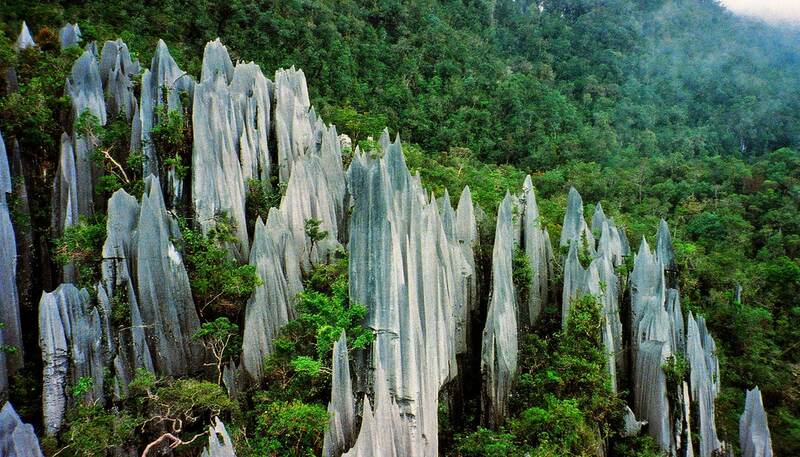 Group of very impressive, 20 – 50 m tall limestone needles – pinnacles rising above the rainforest. Phang Nga Bay with Ko Tapu (James Bond Island) – Thailand, Phang Nga province, South. Sea bay with beautiful karst pinnacles and islands. Ko Tapu is approximately 20 m high, rocky monolith rising from the Phang Nga Bay. Popular tourist attraction, especially because this island was featured in the James Bond movie in 1974. The area contains many more similar islands. Rammang-Rammang – Indonesia, South Sulawesi. 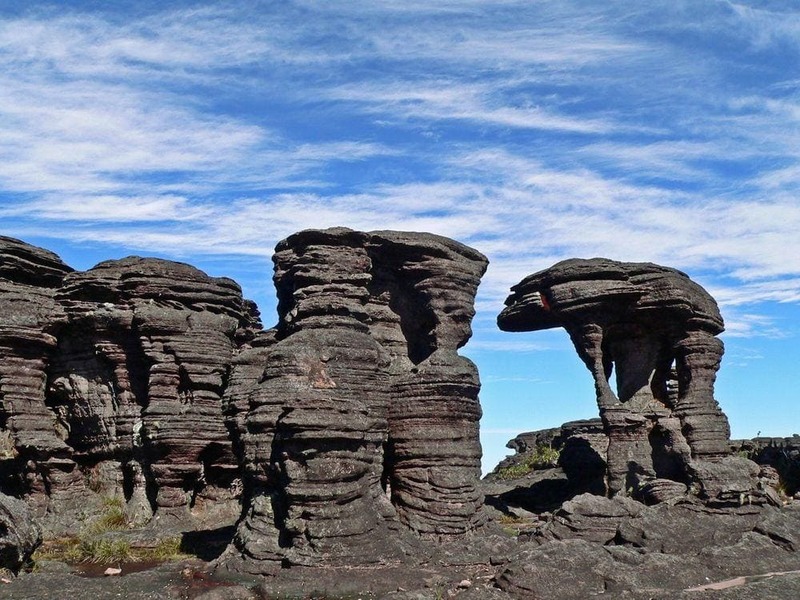 The area with very interesting karst landscape, consisting both of large cone-shaped hills and smaller mushroom-shaped rocks, canyons and caves. Sangkulirang Mangkalihat – Indonesia, East Kalimantan. Extremely impressive karst landscape with numerous caves. Numerous endemic species of plants and animals, caves with prehistoric art (Gua Tewet), unexplored areas. Yana Rocks – India, Karnataka. Very impressive group of unusual limestone rocks rising above the forest. Especially impressive are two rock formations – Bhairaveshwara Shikhara and the Mohini Shikhara, rising up to 120 m tall. Chillagoe massif, Mungana limestone formations – Australia, Queensland. Limestone towers which rise up to 40 m above the surrounding landscape. In this area are known some 600 – 1000 caves. Karst landscape at Huvalu Forest – Niue, south-eastern part, along the sea. 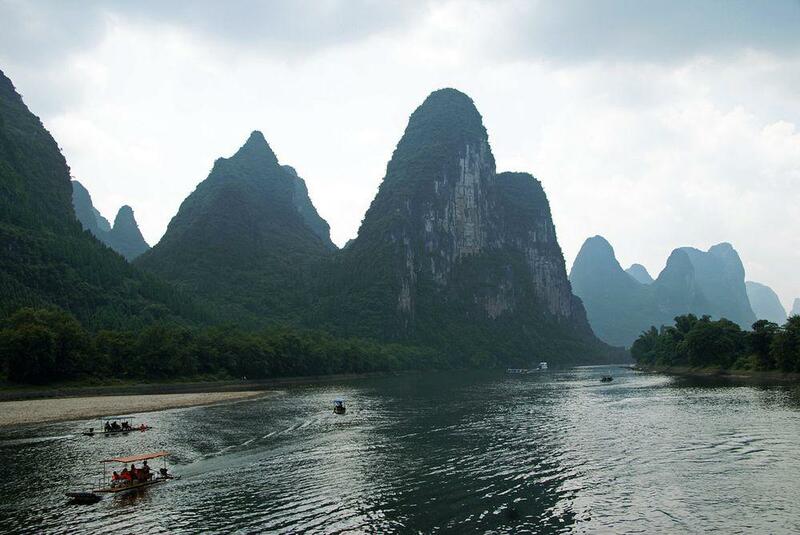 A belt of impressive karst landscape, consisting of thousands of upright, 5-8 m tall limestone peaks with sharp edges. Limestone forest – Guam, northern part, in the area of Andersen Air Force Base. Last remnants of the original tropical forest of Guam. Contains many rare and endemic species of plants. Mamo plateau – Papua New Guinea, Southern Highlands Province and Western Province. Unique landscape – here close together are located more than 100 giant sinkholes, up to 600 m wide and up to 420 m deep (Uli Malemuli sinkhole). Numerous waterfalls falling into sinkholes. Mount Kaijende pinnacle karst – Papua New Guinea. 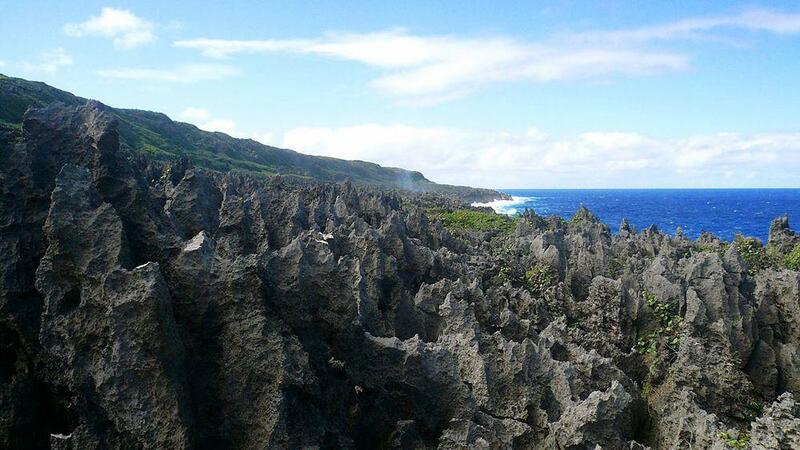 Very impressive “forest” of limestone pinnacles which rise up to 100 m tall. Almost impenetrable area with extremely high biological diversity. Mount Maetambe karst area – Solomon Islands, Choiseul. An area with intense karst processes, with subterranean rivers, sinkholes. Largely unexplored. Forest contains numerous endemic species, more finds expected after speleological research. Pancake Rocks, Punakaiki – New Zealand, West Coast. Heavily eroded limestone cliffs which resemble stacks of countless pancakes. The Pinnacles – Australia, Western Australia, Wheatbelt. Desert, filled with amazing limestone formations – pinnacles. Hoher Dachstein – Austria, Upper Austria and Styria. Limestone karst area in Alps with barren limestone plains, with numerous caves. Steinernes Meer – Austria, Salzburg and Germany, Bavaria. Karst plateau in the Alps. At some places the ground is pure limestone with numerous deep trenches. Here are known some 800 caves. Totes Gebirge – Austria, Styria. 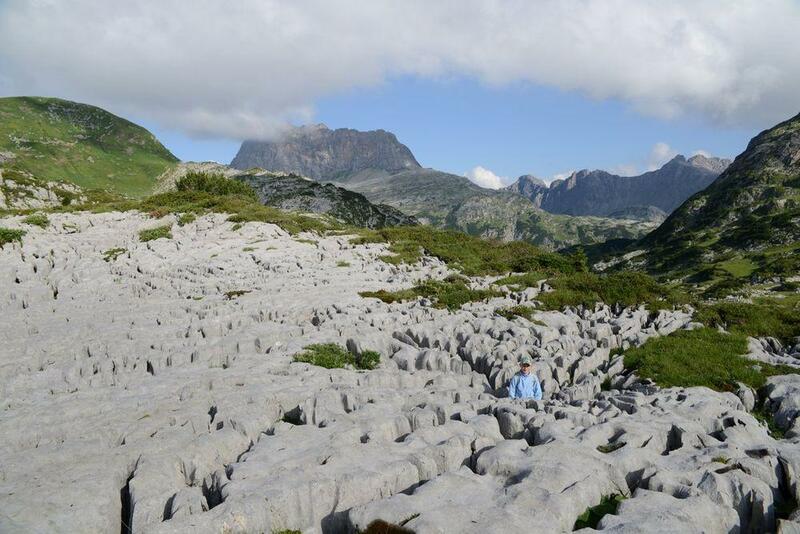 Limestone plateau in Alps, devoid of vegetation. In some places the limestone pavement is very impressive. Chaos de Montpellier-le-Vieux – France, Midi-Pyrénées, Aveyron. A 120 ha area covered with amazing cliff formations, formed in dolostone. Most impressive is a large natural arch – La porte de Mycène. Dent des Crolles – France, Auvergne-Rhône-Alpes. Karstic mountain which rises 690 m above the surroundings. Contains some of the largest caves in the Europe as well as impressive limestone pavements. Désert de Platé – France, Auvergne-Rhône-Alpes. Barren plateau with very impressive limestone pavements. Burren – Ireland, Clare. One of the best examples of glaciokarst anywhere. These undulating hills, for the most part, consist of barren limestone pavements. In the limestone, cracks grows an unusual community of plants – a mix of the Arctic, alpine and Mediterranean species. Ciudad Encantada – Spain, Castile-La-Mancha. Group of impressive rock formations shaped by karst processes. Some rocks look like oversized mushrooms rising over the trees, some resemble animals and humans. El Torcal de Antequera – Spain, Andalusia. Impressive karst landscape with rugged, barren limestone pavements, many amazing limestone formations. La Zaplaz karst formations (Deubel Holes) – Romania, Argeş. Group of amazing karst arches – holes. Livanjsko field – Bosnia and Herzegovina, Canton 10. World’s largest karstic field – polje. Its area is 458.7 km². Field contains multiple and diverse karst features. Northern Velebit with Rožanski Kukovi – Croatia, Lika-Senj. Picturesque karst formations in Dinaric Alps – limestone hoodoos, karrens and many other typical limestone karst forms. 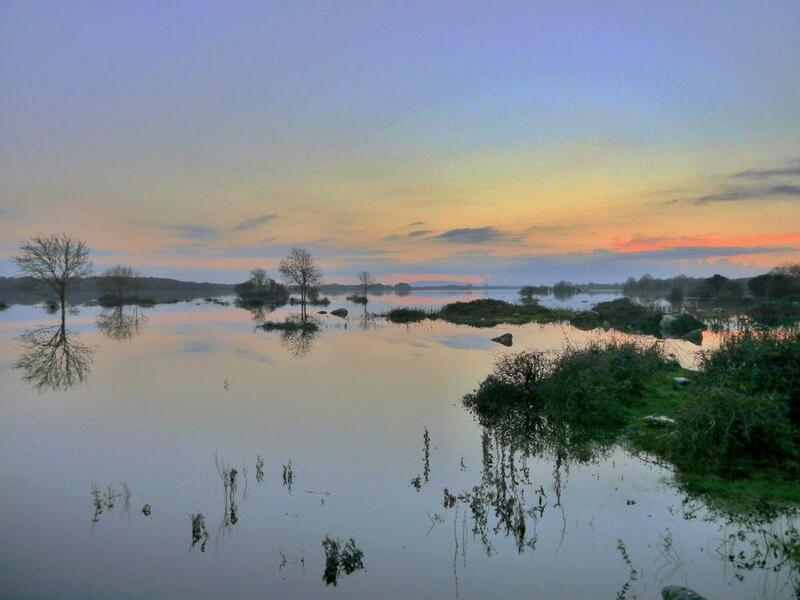 Rahasane turlough – Ireland, Galway. The largest turlough – seasonal lake, which appears and disappears through a sinkhole. Area of the lake reaches 257 ha during the winter, but in the summer here is pasture. Cockpit Country karst area – Jamaica. Large area with enormous limestone cones. This inhospitable, rugged area is covered with pristine rainforest and holds huge biodiversity values. Here are numerous caves. Hell – Cayman Islands, Grand Cayman. An area covered with limestone pinnacles, formed by karst processes. If a pebble is thrown in it, it sounds as if falling for a long time. Karst Forest – Puerto Rico, north-western part. Several areas with spectacular “haystack” hills, covered with lush tropical vegetation. An area with high biological diversity. Los Haitises – Dominican Republic, Samana, Sabana de la Mar And Monte Plata. Interesting karst region, covered with tropical forest. Consists of hundreds of conical, 200 – 300 m tall, steep hills. Numerous caves, underground rivers, rare species of animals and plants. Mogotes de Jumagua – Cuba, Villa Clara. Group of 8 forested limestone hills. These hills have served as a refuge for numerous species of plants and animals not met anywhere else. In the hills have formed caves. Interesting endemic species is Thrinax ekmaniana – a spectacular palm, some 100 trees remain. A site of many legends. Madre de Dios Island – Chile. One of the world’s most impressive limestone karst areas. Most active karst processes in the world thanks to a high amount of precipitation as well as wind action. Magnificent, otherworldly landscapes, enormous caves. Marble Caves – Chile. A group of visually very impressive caves and columns formed by the coastal erosion in a giant monolith of marble. Mount Roraima formations – Brazil, Venezuela and Guyana. The famous table-mountains in this part of the world have near-unique karst formations in quartzite. Although this rock is almost not soluble, it has been exposed to the atmosphere for many millions of years and as a result, it has been eroded by water, creating countless very interesting formations. Limestone, dolostone and gypsum are quite common rocks and cover major part of the land. These rocks are soluble and, as water reaaches them, sooner or later voids are forming in the rocks – and the dissolved material is deposited elsewhere, along the path of streams. Sometimes, if no other rocks cover the land, the soluble rocks are exposed to the elements and our eyes. And, if the layer of the rock is thick and uniform enough, interesting formations are developing after some time. Well, geological time, e.g. tens of thousands of years or even millions of years (in the case of quartzites). Wondermondo has included in this category these places of the world where a larger area of soluble rocks is exposed and water has shaped unusual terrain from this rock. And, well, some of these places are VERY unusual! Take one of such places – Tsingy de Bemaraha in Madagascar. Here the former layer of limestone has been washed away, leaving just narrow, vertical needles and arrows of the rocks, rising even 120 m tall. Walking across such area is nearly impossible – one gets lost in this natural labyrinth and simply cannot pass over these limestone sheets and needles. Lush vegetation grows among the limestone sheets and needles, many rare and sometimes dangerous creatures live here undisturbed by people. Take another – Cockpit Country in Jamaica. Here dense rainforest grows over countless steep hills which resemble haystacks. Again – one can get easily lost among the endless “sea” of these giant haystacks. 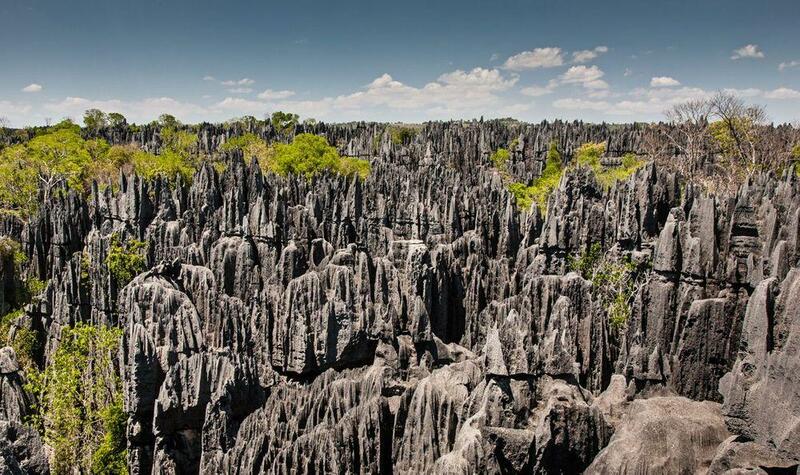 Tsingy – areas which are covered with bare, knifelike vertical sheets of limestone. These dramatic karst landscapes are not very common. The best and maybe – most impressive – are the tsingy “forests” in Madagascar, as well as Shilin stone forest (China), Mount Api pinnacles (Malaysia) and some more places around the world. Limestone pavements are somewhat less dramatic landscapes if compared with the previous kinds of karst landscapes. These are barren fields of pure limestone – but as this rock is soluble, the surface of limestone is dissected with shallow runnels, with deep trenches – grikes, smaller holes and larger holes – sinkholes. Thus a limestone pavement is unusual, fascinating type of landscape. Impressive limestone pavement is Burren (Ireland) – world’s largest limestone pavement with an area of 290 km2. Turloughs are very specific places, found almost exclusively in Ireland. These areas have lakes which appear and disappear seasonally – e.g. suddenly appear in autumn and the disappear in the spring. Sometimes these lakes appear in a few hours time and then in a few days are gone again. This category does not include many karst features, e.g. caves and separate sinkholes, rock stacks, karst springs. Physical landscapes are one of the most fascinating facets of our Planet, which tell stories about the evolution of the surface of the Earth. This book provides up-to-date information about the geomorphology of the selected ‘classic’ sites from around the world and shows the variety of geomorphological landscapes as moulded by different sets of processes acting over different timescales, from millions of years to days.